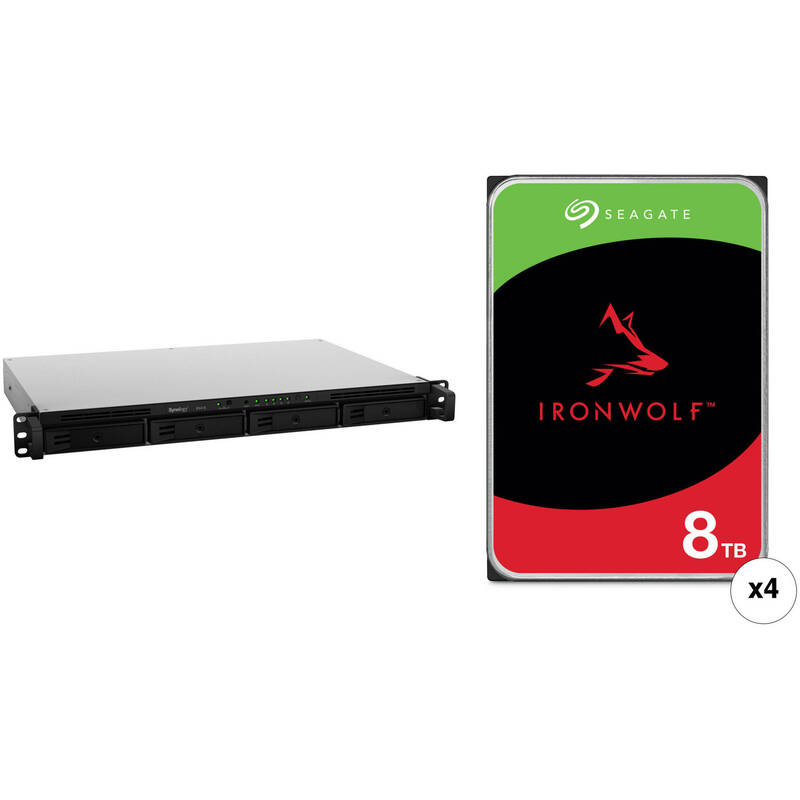 This B&H Kit combines the Synology RX418 4-Bay Expansion Unit with four Seagate 8TB IronWolf 7200 rpm SATA III 3.5" hard drives for a total storage capacity of 32TB. The RX418 4-Bay Expansion Unit from Synology is designed to provide storage expansion for their RS818+ RS818RP+, RS815+, RS815RP+, RS816, and RS815 NAS arrays. It can also be used as a dedicated local backup destination for Synology 1 RU RackStation arrays for comprehensive data protection. The four drive bays of the RX418 natively support 3.5" and 2.5" SATA hard drives and SSDs. The drives are hot-swappable and there is also RAID management through Synology Disk Station Manager. The RX418 is equipped an eSATA port, which allows for connectivity with your host NAS, and operates using a 100W power supply that run using 100-240 VAC at 50/60 Hz. Included is an accessory pack, an AC power cord, and an eSATA cable. When the storage capacity on a Synology 1 RU RackStation reaches its limit, Synology's RX418 expansion unit provides easy capacity expansion by adding four 3.5"/2.5" SATA drives to the system. The Synology RX418 can also be used as a dedicated local backup destination of a Synology 1 RU RackStation for comprehensive data protection. Simply connect the Synology RX418 to a corresponding Synology RackStation and it is ready to use. Drives in the connected Synology RX418 operate as though they were internal to the connected Synology NAS and can be managed directly by Synology DiskStation Manager (DSM), with no additional software installation required. Synology's DSM provides an intuitive user interface for easy system management. Drive hibernation can be configured in DSM to take effect automatically when the system has been inactive for a period of time. This not only saves energy but also extends the lifespan of the installed drives. Box Dimensions (LxWxH) 20.7 x 15.7 x 5.6"